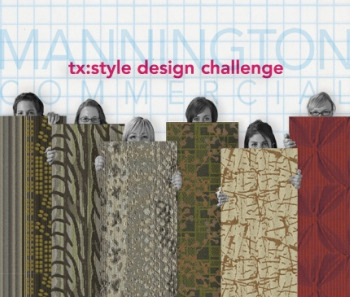 CALHOUN, Georgia - Beginning today, Mannington Commercial invites the design community to vote for the grand prize winner from finalists' designs in the tx:style design challenge. "In February, nearly a quarter of a million votes were cast to select these six unique designs as finalists," says Natalie Jones, vice president of commercial brand development and creative product. "Six designers whose talent far exceeds their experience were chosen out of 440 design entrants. And now, we're ready to see which pattern designers around the world choose as our grand prize winner." In the two months since announcing the finalists, Mannington's design development team has worked closely with all six designers to develop patterns, manufacture product and create coordinated colorways. The six designs span the gambit of inspiration and application for contract interiors projects, ranging from organic to geometric, from layered patterns to pure texture. Developed entirely for and during the project, the patterns are being offered to the public, for final selection of design that earns its creator $7,500 and rock-star launch of a full production line of commercial carpet. Voting closes at 12noon Central Standard Time on 16 June 2009, for the winner to be announced during NeoCon, the world's largest contract interiors trade show. "Tx:style has been the most successful online social networking of its kind in our industry, and such a great way to open product design up to the public and engaging designers for immediate feedback," says Jones. "Just as importantly, working with young designers and giving them this opportunity has been a great reminder that in challenging times, their opportunities are often limited," she continued, adding, "The creativity, energy and design sensibility of these six finalists is a fantastic reminder that great design can lift the spirit, and inspire, in any economy." Voting is open online at www.txstyle-mannington.com and updates are available on Mannington Commercial's Facebook fan page. Neocon will be held from 15 to 17 June at the Merchandise Mart in Chicago.